With the upcoming Labor Day weekend and, for most folks, the last blast of summer swimming pool season — it just seemed appropriate to share our post from last summer — again. Enjoy your pool, but by all means, play safely! No one can argue with the monumental importance of pool safety — but even with tighter community regulations and technological advances in safety products, the Consumer Product Safety Commission (CPSC) reports that over 300 children under the age of five drown in residential pools each year nationwide. 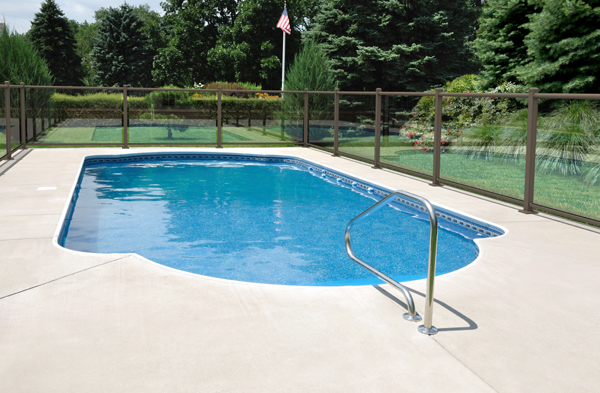 In order for you to keep the ones you love safe and sound, experts agree that implementing multiple layers of protection is one of the best ways to create a comprehensive safety plan for your pool. Does PVC Fencing Make A Safe Fence For Horses? PVC (Vinyl) rail fencing has been on the market for approximately 20 years. Years ago we became more aware of the impact of using wood for building materials as well as fencing. Alternative composites were being developed to help lessen the demand for wood. Polyvinyl chloride (PVC) had been used to make thousands of products from fencing, house siding, mail box posts, etc. 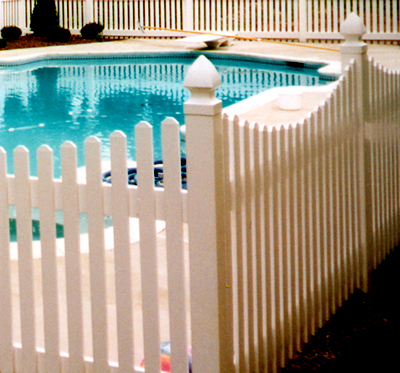 With new technology and the addition of Ultra Violet (UV) inhibitors, whitening additives (titanium dioxide), and fungicides, a whole new market began in decorative residential fencing as well as railed fence. As residential owners began using PVC as an alternative to wood, horse owners liked the look and benefit of never having to paint their fence again. Proper installation is very important, always follow manufacturer’s instructions or hire a professional, such as Anchor Fence in Michigan. The internet is loaded with articles leading a horse owner to believe that PVC is a very safe fence and that it will break without injuring a horse. That is true. However, before purchasing a PVC fence for your particular horse/horses, there are some important facts that need you need to know. Proper installation is critical – as with every fence that you install, hiring a professional is your best bet such as Anchor Fence. Since PVC is light weight, all posts need to be concreted into the ground. If not, after a short time the posts will lean from the wind, ground conditions or horses leaning on them. Setting posts straight will allow the optimum amount of rail to be in the post, making the fence stronger and helping if an impact occurs. A flat cap for a vinyl fence. 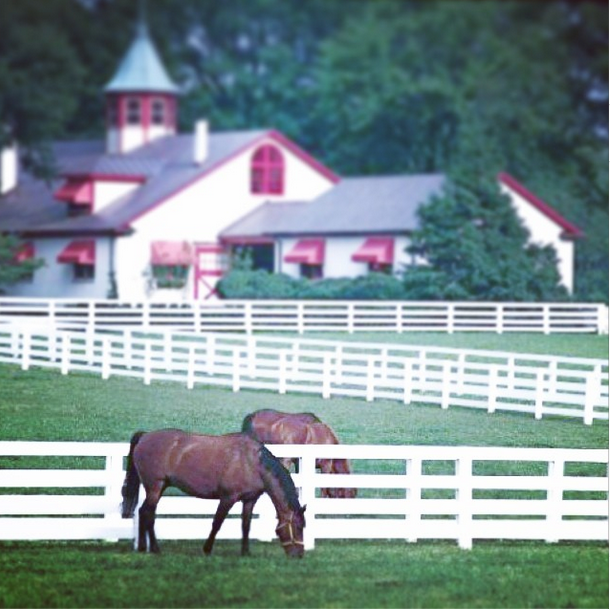 If you have a vinyl fence installed to contain your horses, make sure to get flat caps. This is to prevent the horse from chewing on the material, which can save your horse from choking and save your fence from being destroyed. The prices of wood material has been increasing over the years, so much that a vinyl fence can cost the same amount as a wood fence, if not less. Unlike wood, vinyl fence will never rot or mold also most fence companies, including Anchor Fence have a lifetime warranty on vinyl material as opposed to wood material which normally comes with no warranty and does not hold up too well in Michigan weather. #2 – Restore your wood fence Some fences, even those 15-30 years old can be made to look like new with a 2-3 day fence makeover restoration. Years and even decades of gray/black mold, mildew, nail/screw black drip stains, and peeling paint, or old stain can be power washed away in one day on a typical fence! #3 – Power wash the fence before you stain it. Professional power washing (also known as pressure washing) will clean away years of gray/black mold, mildew, nail/screw black drip stains, peeling paint, and old stain. 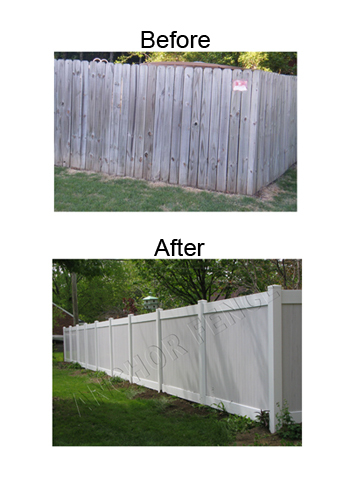 Stain will also more easily adhere to a fence that has been properly power washed. Power washing is very affordable to have done by a fence makeover and restoration company. But if you choose to do the power washing on your own, you should use a pressure washer machine with 3000 to 3600 psi. Smaller home model pressure washers normally will not have enough power to adequately clean the fence before it is stained. If you don’t have access to a commercial pressure washer, you can rent one from Home Depot or an equipment rental stores for usually under $100 per day. WARNING: When using a pressure washer be extremely careful because it is easy to permanently damage your fence by putting noticeable cut marks into the wood. If the spray accidentally hits your hands, arms, legs, or feet you can also experience serious cutting injuries since the powerful spray will quickly cut through clothing and skin. Be sure to wear safety goggles because splinters and dirt can easily get into your eyes. Wear very old clothes when power washing because you will get caked with layers of black gunk. Also be sure to power wash using the 25 degree tip for your sprayer. Smaller tips will burn cut marks in your fence and larger tips will not adequately clean the fence in preparation for staining. If you have never done power washing before, be sure to practice on some old throw away boards to get a feel for it before starting on your fence. #4 – Don’t use cleaning products on your wood fence. There are a number of products on the market that promise great results to clean your wood fence. While some manufacturers may be unhappy with our experience, we have tried a number or products and not yet found anything that is worth the time, money, and hassle to use them. We have not yet found anything that works better than plain old fashion garden hose water coming through a commercial grace pressure washer to clean your fence and get it ready for staining. Fence cleaning products tend to be messy, add to your costs, are frustrating to apply, the chemicals can sometimes destroy the vegetation or grass around your fence, and frequently they just don’t work well. The only exception we have to this rule is that we do use a cleaning gel and scraper on fences that have old peeling paint. After the gel has been applied and the fence scraped, the power washing will get your fence ready for staining. #5 – Be sure to check with your city or homeowners association about stain colors. Some municipalities and homeowner associations have very specific restrictions on what color stain you can use on the fences in your neighborhood. #6 – Don’t use a clear-coat finish, semi-transparent stains, paint, or poorly-rated solid stains. When you use these type of products they will not cover over blemishes and nail/screw drip stains, variations in the old and new wood will be obvious, and normally the fence will only look good for a couple of years. This means that if you want a good looking fence you will need to spend the time, effort, and money to do it all over every 18 months to 3 years. Avoid using paint because over time paint will begin to peel in the high humidity and harsh winters of Michigan. Consumer Reports did a 3 year, 6 year, and 9 year study on fence and deck wood stain products and the hands down winner was Behr solid color wood stains for fences, decks, and siding. Many of the stains by other manufacturers didn’t even last 3 years. Behr stains provide quality, durable, and long-lasting results. #7 – Work with your neighbors. Many fences in Michigan are not stand along fences but instead are commonly shared fences with your surrounding neighbors. Work with your neighbors to avoid any disagreements on fence style, color and/or material.